One time, during a presentation, I asked an audience member a question. Instead of getting the type of answer I expected, I got one that left me feeling flustered and embarrassed. I wished I could crawl into a hole and hide. But I knew how to get past it and continued delivering a good presentation. Later, I received comments from several participants saying that how I’d handled that moment was their favorite part of the presentation. Stuff happens. Usually, you hardly notice. 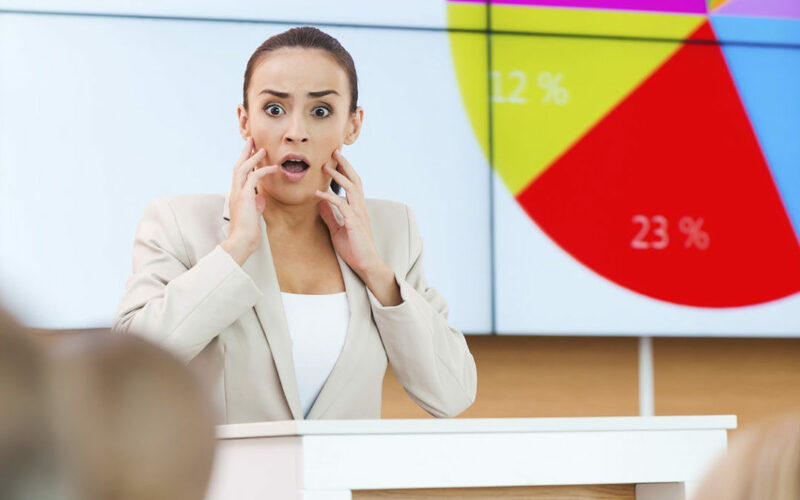 But when stakes are high, it can throw you off your game: you drop something, technology fails you, you forget a key point, or someone makes an inappropriate comment. These “little” things don’t feel very little when all eyes are on you! And sometimes, the mistakes and surprises really aren’t little—sometimes they have far-reaching consequences. What to do? Make navigating failure a habit. When you’re in survival mode and your brain has frozen from horror, you need practiced skills and habits to fall back on in order to move forward quickly with competence and grace. Here are three things to practice so that when things go wrong, you can get back on track right away and maintain credibility. I am an optimist. I look for the good in every situation and always hope for and expect the best. And certainly, if you have something important coming up, like a speech or job interview, visualize success. There is great power in imagining a positive performance in vivid detail. Expecting the best doesn’t mean ignoring reality, however. Nothing EVER goes 100% perfectly. You’re not perfect, your “audience” isn’t perfect, the setting and circumstances aren’t perfect. Yet still we expect perfection. Give up the fantasy. The more you expect a certain outcome, the greater your mental and emotional turbulence when things don’t go as hoped. Hope for the best, and be prepared for the worst. We don’t like to think about the possibility of failure, because we’re afraid we’ll create a self-fulfilling prophecy. But if you acknowledge negative possibilities, you’ll discover two helpful benefits: First, you can imagine yourself overcoming the problem. Second, you’ll realize it’s not so scary after all. Bad things will sometimes happen. You can handle it. Especially if you’ve practiced in advance. Many athletes use a specific physical act to serve as a transition when they’ve screwed up. Some coaches suggest making a fist and turning it, like you’re flushing the mistake down the toilet. Improviser Matt Smith suggests lifting your index finger in a miniature “failure bow.” I lightly flick my finger as if I’m flicking the mistake away like lint. These physical acts acknowledge the mistake and then prompt a conscious choice to move past it. Lift your head (not your chin, your whole head). Speak with a confident voice tone. These acts keep you grounded, remind yourself and your audience that you can handle the issue, help you refocus, and bring you into the present moment. And it’s only in the present moment that you have any power. The mistake—that happened in the past. It’s over and done and gone. You need to deal with it; but you can’t do that if you’re frozen in fear or shame, watching your mistake over and over on the instant replay jumbotron in your head. So, flick the mistake away, get present, and move forward. Unfortunately, these are all the exact opposite of what you feel like doing when surprised or humiliated. That’s where practice comes in. Make it a HABIT to get back up and move on gracefully in everyday interactions, and you’ll start to do it naturally even when stakes are high. Later, when you’re alone, evaluate. Be honest in your assessment of your “performance.” That means neither glossing over nor overinflating mistakes. Give yourself credit for the things you did well. Learn from the things you didn’t handle well. Wallowing in shame robs you of both benefits: you lose the satisfaction and the growth that come from an honest self-appraisal. When you can recover from mistakes, your confidence increases. 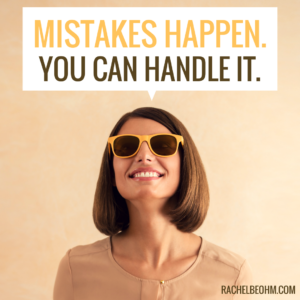 You know mistakes will happen, but you also know you can handle them. You don’t need to blithely ignore them, fear them, or resent them. You can accept them, deal with them, and learn from them.